I recently visited the Tucson Botanical Gardens. Each winter they have an indoor live tropical butterly exhibit - this year, at least, called Butterfly Magic at the Gardens. I managed to capture many amazing shots of the beautiful butterflies. 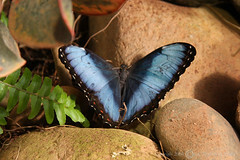 This however, a Blue Morpho, sitting still with its wings open is an extremely rare sight. Either it had just emerged and was waiting for its wings to dry or it was near the end of its life; sadly I suspect the latter due to the tattered spots on the wings. If you're Tucson between now and March 31, 2009, please consider a visit to this beautiful and educational exhibit and the gardens in general - you won't be disappointed! Well if this little one was on its last leg it is great you had a chance to immortalize it right? Gorgeous creature, such bold color. Amazing shot!